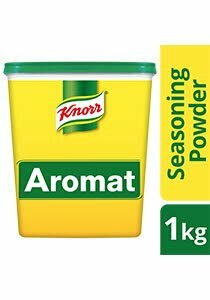 Knorr Aromat Seasoning Powder is a finely-balanced blend of quality herbs & spices that enhances the flavour of foods without overpowering. Ideal as an all-purpose seasoning when cooking. Salt, Monosodium Glutamate, Cornflour, Lactose (Milk Derivative), Hydrolysed Vegetable Protein,Onion, PalmOlein, Silicon Dioxide, Spices, Sodium Inosinate and Guanylate, Celery Seed. All Food Additives Are of Plant Origin and Synthetic Origin. May contain traces of cereals containing gluten, egg, soy, fish, crustacean, molllusc, peanut and tree nuts. - Made by Chefs exclusively for Chefs. - Versatile usage in a wide variety of applications - gravies, soups, pasta, rice and cream sauces. - a great all purpose seasoning that can be sprinkled over cooked meat, chicken, vegetables, hot chips or deep fried foods. 33 399 Points X3 POINTS! 30 378 Points X3 POINTS!